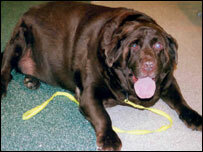 A dog that was at the centre of a cruelty case after it reached 11 stone (70kg) has shed half its body weight. Rusty, a chocolate-coloured Labrador, is a shadow of his former self after losing nearly six stone (35kg) in less than two years, the RSPCA said. The animal welfare charity intervened when Rusty was overfed by his owners. Derek Benton, 62, and his brother David, 53, were found guilty of causing unnecessary suffering to the dog after a trial in Ely, Cambs, in January 2007. Magistrates gave each a conditional discharge and said Rusty could return to their care if he was properly fed and cared for. The RSPCA said Rusty weighed 11 stone 7lb (73kg) when he was seized by inspectors in March 2006 and by January 2007, following a special diet by vets, he had lost nearly four stone (25kg). Derek and David Benton had denied mistreating the dog and said they were "flabbergasted" when prosecuted.